Maku’u Backyard Grower’s makes it thru it’s first month!! It’s been a month since we opened a booth at the Maku’u Market. Since then we’ve expanded our ranks of growers to over 2 dozen from Hawaiian Acres, HPP, Orchidland, Ainaloa, & Pahoa. Our first month’s sales have exceeded expectations at over $650. Plus, we’ve donated over 50lbs to the Big Island Food Basket. The community has been super supportive, appreciating the fact that we’re helping to bring backyard produce to their tables. People see what we’re doing and they like it. Mary and I have been having a lot of fun at the market, building a relationship with the growers of the co-op and with the overall community at large. We even get to have our baby girl hang out with us while we work! As people become familiar with our presence at the market, we expect that the co-op will continue to grow, backyard growers will earn more cash, and our island’s food security will be that much more secure. If you haven’t had the chance to check us out at the market yet, come on by. We’re there every Sunday until 1:30pm, booth F-15 (unless I oversleep :). Our first day at the market went better than we could hope for. We had better than expected sales, signed up a few new growers, and met a lot of amazing people. We showed up at 5:30 in the morning to get in line for booth space, only to end up #32. Next time we’ll have to sleep over. We did get a nice spot for our booth, next to some other produce vendors. We set up our booth, which had lots of color and a nice display of produce from our growers. James Weatherfield supplied us with pounds of avocados and bananas from his backyard orchard. Carol Noel gave us a nice selection of citrus, including grapefruit, lemons and even some sapotes from her backyard farm in Orchidland. Barbara Fahs supplied us some wonderful herbal product from Hi’iaka’s Herbal Garden in HPP. 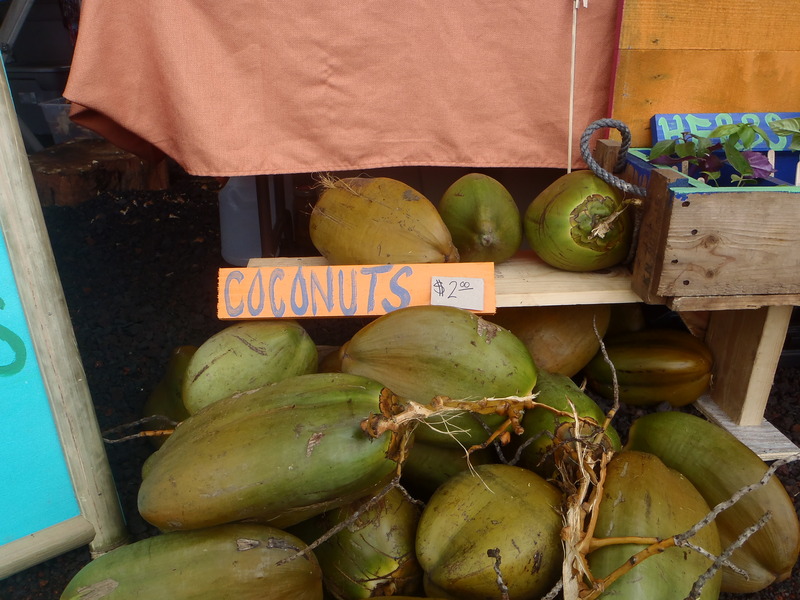 Coconuts were also brought in and opened fresh for the customer. Those were wild harvested in Hawaiian Beaches by Sean at Tulsi Gardens. We’ll be there again this coming Sunday, hopefully with a lot more to offer. Looking forward to seeing you all there!! We’ve been working hard getting ready for our first market day in a little over a week. We’ve been spending lots of time on the phone, visiting our growers farms and making signs for our market display. We’re having lots of fun during this time of creativity. We hope to have one of the most colorful and well put together booth at the market. Anyone have any tips you’d like to share for what you’d like to see at a Farmer’s Market Booth? Maku’u Growers Co-op is in the Paper!! Hey everybody! We’re covered in this week’s Big Island Weekly. Read the story here. Thank you Barbara Fahs for writing about what we’re doing! We are really excited to bring together the small growers in our area and we’re glad that word is spreading. The idea is spreading too, more co-ops are forming in the Honoka’a area and South Kona. Let’s show Hawaii that it is possible to eat local. 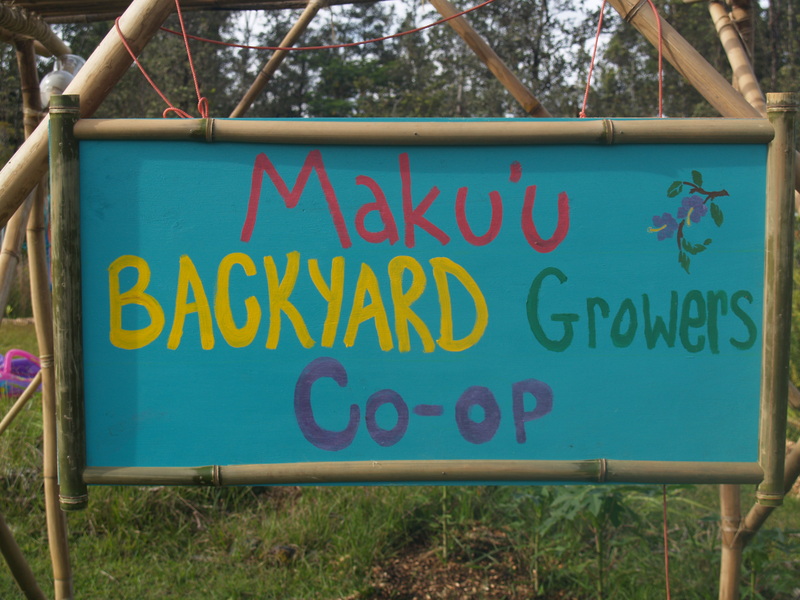 You’ve stumbled upon the website for the Maku’u Backyard Growers Co-op. We have just begun to form this exciting new venture and we are looking for more growers. If you live within a 5 mile radius to the Maku’u Farmers Market and have some fruit, veggies, nursery starts, or other farm fresh products then you are a perfect candidate to be part of the co-op. To learn more about how this works, check out our FAQ page. We are excited to bring together a network of backyard growers so that we can collectively sell fresh, local food at our local market. At the same time, we hope to build a stronger, more vibrant local economy by giving small backyard growers a chance to make some money with the food they are already growing. Be sure to tell all of your friends who grow food about the Maku’u Backyard Growers Co-op and please “Like”us on our Maku’u Backyard Growers Facebook page. If you are as excited to see a growing local economy and more access to local foods as we are, then think about donating to the cause. Either fresh produce from your garden or a few dollars thru paypal, it is all welcome.